Sprinkle the flour on the work surface. Unfold the pastry sheet on the work surface. Roll the pastry sheet into a 10-inch square. Brush the bottom half of the pastry sheet with the egg mixture. Sprinkle half the garlic, parsley and cheese on the bottom half of the pastry sheet. Fold the pastry in half over the garlic mixture. Brush the pastry with the egg mixture. 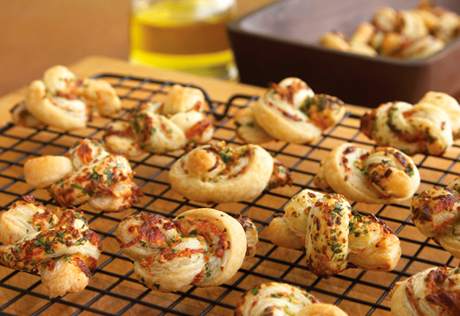 Sprinkle the remaining garlic, parsley and cheese on the pastry. Roll the pastry lightly with a rolling pin. Cut the pastry into 20 (about 1/2-inch-wide) strips. Tie each strip into a knot. Place the pastries onto 2 baking sheets.